Regular dental care is an important part of equine wellness care. Horses have a hypsodont tooth and an anisognathic jaw conformation. This means that the upper jaw is wider than the lower jaw, an arrangement that maximizes a horse’s chewing efficiency. A horse’s teeth and bite are important for more than just chewing efficiency – the bite is also but also for behavior and training. Many behavioral issues are linked to dental problems, such as equine TMJ. A young foal typically receives an oral health exam shortly after birth. This includes a brief visual and digital examination of the foal’s bite. A normal bite ensures the foal’s teeth will properly develop into adulthood. Identifying bite abnormalities at an early age is the best way to prevent and correct problems such as parrot mouth or sow mouth. The frequency with which horses receive oral exams is dependent on several factors. In general, equine veterinarians recommend bi-annual exams until a horse reaches five years of age. The first five years are a critical period for identifying tooth and jaw abnormalities and taking decisive steps to correct these problems. However, oral care and exams should not be limited to a horse’s first years. Regular oral health exams should be part of every wellness checkup. During this exam, an equine dentist will check a horse’s bite and then file the teeth to keep them smooth and contoured. Filing teeth, also known as “floating a horse’s teeth” eliminates discomfort and pain while chewing, protecting a horse’s hypsodont tooth and an anisognathic jaw conformation. Following a dental exam, horse owners often receive a detailed chart outlining the horse’s mouth and recommendations for follow-up care. As horses age, a bi-annual oral exam is important for monitoring the health of a horse’s molars and watching for signs of excessive wear. As molars begin to wear out, horses become less efficient in processing and grinding feed. Minor adjustments to a horse’s diet can help prevent excess wear and tear and extend the life of a horse’s molars. Identifying excessive wear and tear as early as possible will allow a veterinarian to design a custom dietary program to suit a horse’s specific wellness needs. 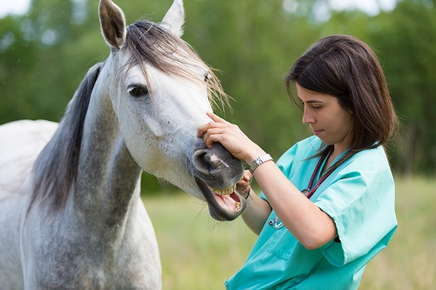 Since a horse’s mouth requires expert care, carefully select a licensed equine veterinarian with experience treating oral health problems to examine your horse.